Mike Eng just completed three terms in the State Assembly, but his name appears on the ballot for the March 5 election, this time as a candidate for the Los Angeles Community College District Board of Trustees, Office 2. His opponent in the race is John C. Burke, 68, an accounting professor at Los Angeles Valley College. The incumbent, Tina Park, did not seek re-election. Eng, 66, a Democrat, previously served on the Monterey Park City Council and was mayor from 2004 to 2005. He represented the 49th Assembly District from 2006 to 2012 but could not run again due to term limits. During the last legislative session, Eng served on the following Assembly committees: Banking and Finance; Business, Professions and Consumer Protection; Education; Health; and Transportation. He was also a member of the Asian Pacific Islander Legislative Caucus. A graduate of the University of Hawaii, he received his law degree from UCLA. He is a community college instructor, an attorney with Eng & Nishimura, and a board member of the Asian Pacific American Legal Center, Garfield Medical Center, Los Angeles 80/20, and West San Gabriel Valley Boys and Girls Club. 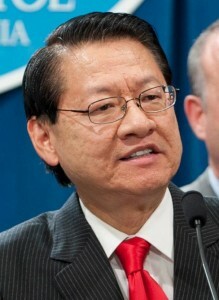 His endorsers include Reps. Judy Chu (his wife), Grace Napolitano, Julia Brownley and Adam Schiff; State Superintendent of Public Instruction Tom Torlakson; State Controller John Chiang; State Insurance Commissioner Dave Jones; Los Angeles Mayor Antonio Villaraigosa; the Los Angeles Labor Federation; and The Los Angeles Times. On Feb. 23, Eng held a press conference in Monterey Park to address the way his name appears on the Chinese-language sample ballot for the March 5 election. He said that the Los Angeles city clerk rejected his actual Chinese name — which appeared on ballots when he ran for the Assembly — and instead used a phonetic transliteration of his English name. Eng, who said he is widely known in the Chinese American community by his actual Chinese name, warned about possible voter confusion and urged city officials to take measures to address this issue in future elections.